Find out more about our Log Stores range. Designed to compliment any garden with their rustic finish, our British made log stores will sit attractively for a number of years. Assembled with pressure treated wood, which comes with 10 year guarantee, you can be assured of its longevity and durability. With alternating slates on the side there is plenty of ventilation to allow your wood to naturally dry and season. 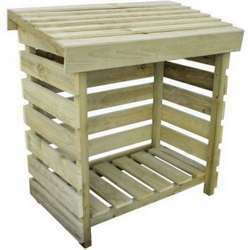 If you would like to discuss buying one of our log stores please contact our sales team on 0845 838 5676.